Here is your chance to open your dream location in one of the most sought after and desirable locations on the San Diego North County Coast. Located right in the heart of the shopping and dining district in this upscale coastal community without the outrageous rent you would expect to be paying for a prime location like this. Save both time and money compared to building out a resturant like this, buy now and you will be in before the big summer business season arrives. Tourists have alread begun their annual migration to the area. Here you have a turnkey restaurant location at the beach. DONE. Move in immediately, with no time lost to planning, permitting etc. Make some subtle changes or keep it all the same, this place is calling your name. Demographics are outstanding and locals love this area, so the streets and sidewalks are filled all year round. The upscale beach city residents have money and right here is where they come to spend it. Gross sales for the location have been consistently in the 500k per year range and they are not even open on Mondays! Seller stated net for 2013 was well over 100k and they are on pace to do even better in 2014! This is an owner operated business that thrives. If you are ready to work, this is a restaurant that will absolutely reward you for it. All summer long and just about any other sunny day you will have the beach going crowds at your door step. Add in the locals and it’s easy to see why this is such a popular retail district. Restaurant has a beer and wine licenese in place. Fun interior and fully built out kitchen leads to this question: what would you like to serve? Keep the current concept or bring your own new idea. The kitchen area has everything you will need for nearly any concept, large 8 ft hood system, six burner stove, ovens,griddle,fryer, it’s all here and ready to go. Burgers, pizza, Mediterranean, Thai, salad concept, it’s your choice, keep the same concept or bring in the concept you have always wanted and success will surely follow at this outstanding location. 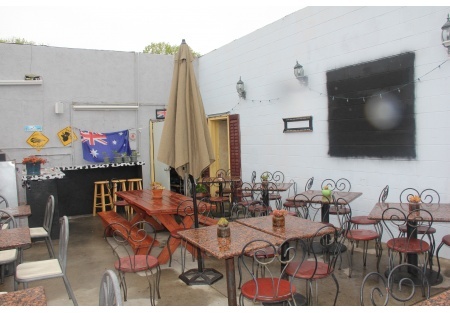 Restaurant has two patios, one on the busy street frontage side and another large sun drenched patio outback which includes an outside bar area. On sunny days you simply cannot beat the outside dining/drinking areas that this restaurant provides. Need even more outside dining space? The permits are already approved for a 35 seat expansion of the front patio, this would be an outstanding addition to an already great dining/drinking experience. Rent is $3019, yes that is the total rent! Rent factor is an extremely reasonable 7-9% of gross sales, great for the flowing of cash to the bottom line. Restaurant space is approximately 1500 square feet inside with another 700 square feet of patio space. Current lease term expires in August 2022 with a two year option available. You will not find many better rents than this along the coast. Rent even includes the water, so one less utility to pay and again helping flow more money to your bottom line. Don’t miss this opportunity to be at the Coast, seconds from the sand and surf and right in the middle of this affluent beach area community. 41 license allows for delivery of beer and wine off premise!